If you're looking at an image of a question mark you may wonder what it's got to do with the classic car, enjoyment or the historic West Sussex circuit. Surrey Se7ens were having a fun day out at Goodwood and I was asked not just to take photographs of the cars and owners, but also to take a shot that could be used on the cover of Lotus Seven Club's award winning magazine Lowflying. A good challenge. 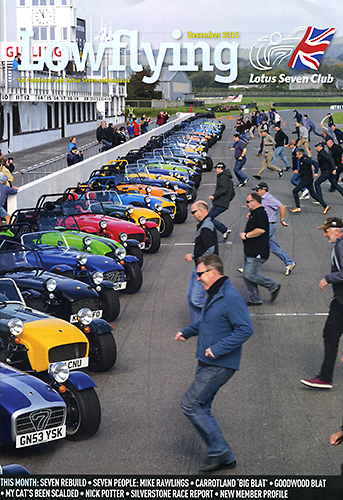 Last time 13-Jun-2015 there were ten Caterhams - today there are 40! In the meantime, you may also like my Modern Cars gallery. The magazine has now been published, so you're no longer seeing the question mark that been next to this article for the past two months - I can now show you a copy of the magazine cover adorned with my photograph!